The highly skilled Vintage Glass staff of over 25 years in the business is experienced in manufacturing quality glass at competitive prices. We've got it or we'll make it. 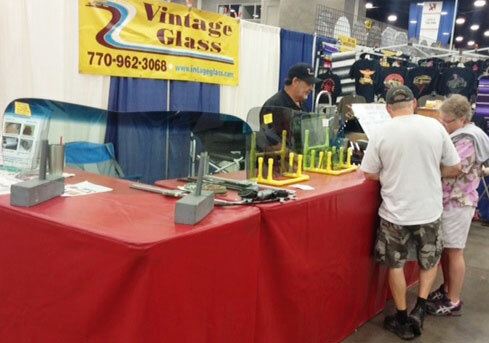 All glass is processed on a CnC machine and cut to NAG specifications. If you require customized glass then customer supplied patterns can be scanned into the CnC machine - at no additional charge. All glass is then polished and tempered (except windshields which are laminated). Flat glass can be purchased online at a cost reduction. Please email us at GlassFinders for all curved glass pricing because we have multiple locations and we'll determine which one is nearest to you to keep the freight cost low. Normal delivery is under 2 weeks. Dealer discounts are available. We do ship worldwide. Orders can also be delivered to 100 car/truck shows we attend across the USA. To contact our CA office please call 760-672-3540. Thanks!